When it comes to organic hair care, John Masters Organics is one of the leader brands. Although I don’t have a good relationship with its shampoos, other hair care products have never disappointed me. 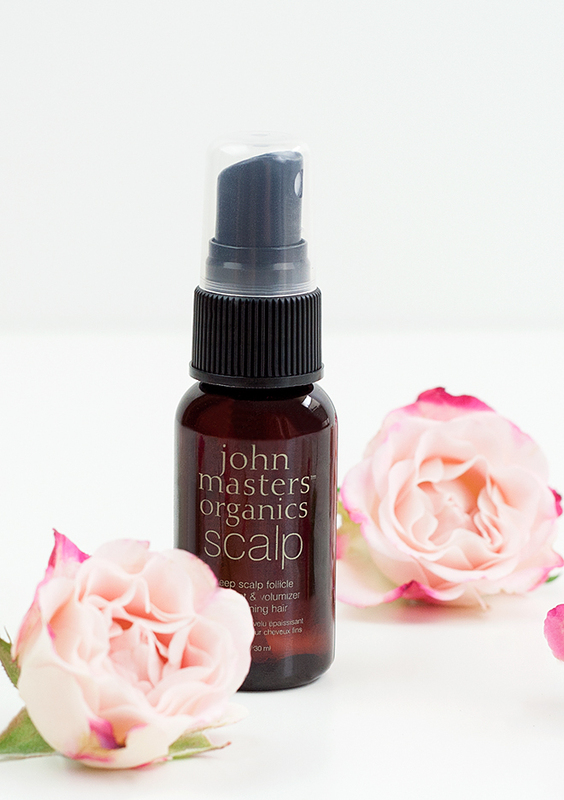 The main reason why I was so excited to try this John Masters Organics Deep Scalp Follicle Treatment & Volumizer was that of its promises to assure nutrient intake, stimulate circulation, balance sebum production, and eliminate free radicals. My hair roots get fine and flat fairly quickly, so a product that would keep them full longer was a product that I wanted. The Deep Scalp treatment comes in a recyclable dark brown 30 ml spray bottle and costs as little as $8 / £6. It’s a trial size product (the full size is available in 125 ml spray bottle), but this amount is more than enough to decide if you want to get a full size. The treatment has a powerful herbal scent, which reminds me of lavender mixed with rosemary. The treatment contains extracts such as Gotu Kola, nettle, arnica, chamomile, lavender – all famous for their hair care benefits. It also contains soothing and stimulating hair care ingredients such as panthenol, witch hazel, hyaluronic acid, and rosemary oil. By the way, I’m not surprised to find rosemary in a treatment like this. Rosemary is considered to be a powerful natural treatment for hair loss and a good hair volumizer. Aqua (Water), Glycerin, Sorbitol, Panthenol (Vitamin B), Centillica Asiatica (Gotu Kola) Extract,* Chondrus Crispus (Irish Moss) Extract,* Plantago Asiatica (Chadian Zi) Extract,* Arctium Lappa (Burdock Root) Extract,* Hydrolyzed Wheat Protein, Urtica Dioica (Nettle) Extract,* Yucca Schidigera (Yucca) Extract,* Hamamelis Virginiana (Witch Hazel) Distillate, Arnica Montana (Arnica) Extract,* Anthemis Nobilis (Chamomile) Extract,* Hyaluronic Acid, Camellia Sinensis (White Tea) Extract,* Lavandula Angustifolia (Lavender) Extract,* Calendula Officinalis (Calendula) Extract,* Tocopherol Acetate (Vitamin E), Carica Papaya (Papaya) Extract, Cucumis Sativa (Cucumber) Extract,* Soy Protein, Sodium Benzoate, Potassium Sorbate, Simmondsia Chinensis (Jojoba) Oil,* Triticum Vulgare (Wheat Germ) Oil,* Thymus Vulgaris (Thyme) Oil,* Linum Usitatissimum (Flax Seed) Oil,* Rosmarinus Officinalis (Rosemary) Oil*. * Certified Organic. I’ve used up almost half a bottle of the Deep Scalp treatment. Because the spray contains water mixed with various extracts, it’s easy to spray on the roots and doesn’t leave any stickiness. It gives a little bit of extra volume, but the effect is more visible after I blow dry my hair. Also, it’s too soon to tell if it did anything else for my hair, but I’ll definitely continue using it, because its benefits may not be obvious at first, but in the long run, it should balance the scalp and strengthen the hair. Have you tried this Deep Scalp Volumizer? What are your thoughts? I always get a bit nervous about spraying stuff on my roots because my scalp gets oily quickly. Did it make you get oily a bit? Not at all, Renee. Just avoid using too much product. I spray 3-4 times, gently rub my roots for just a few seconds with clean fingertips, and then (most of the times) blow dry my hair. Have to try this. Love John Masters products! I have this. Have yet to use it though. I did not know this existed. I have very thin hair so I may have to try this out. I’ve started losing hair lately and I use a Korean shampoo brand specialized in hair loss prevention but it does not help much. Although my hair gets very soft as a result of it, the hair falling does not stop. This is something I will look into.